I packed my button up shirts and tank tops and jeans. Made sure I had plenty of sunscreen and sunglasses. Then I double checked my Trapper Keeper, made sure all of the songs that I’d written were neatly collected inside, and loaded up my backpack. Then we drove with my aunt up I-40 from Little Rock to Nashville. Back then it was still called Fan Fair (see photo above), now it’s called CMA Fest, and either way it was this country music-obsessed teen’s dream come true. 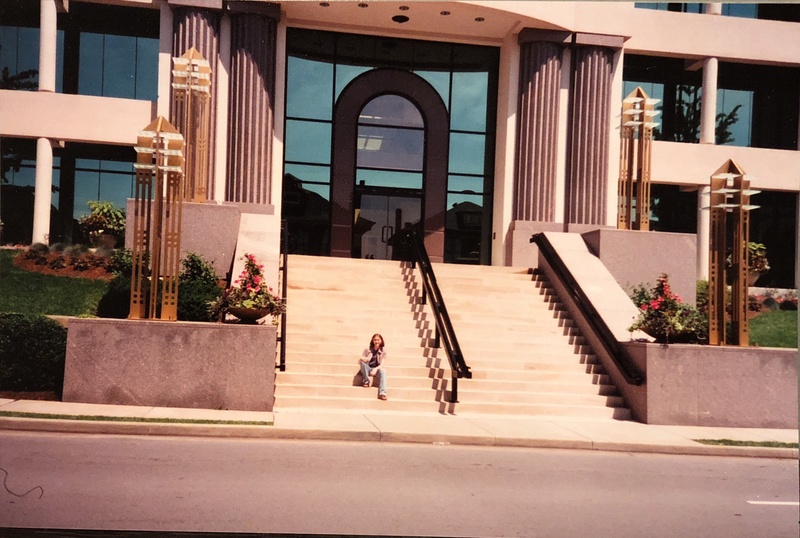 I remember as soon as we hit town driving down Music Row for the first time in complete awe, and stopping at Reba’s office to take my picture on the front steps. I remember touring the Opry, standing in that history-soaked circle, and then that night watching Loretta Lynn in all her sparkly prom dress glory. We sat in the pews of the Ryman and cheered for Linda Davis. Then into the belly of the beast – the fairgrounds at the time – I remember standing in Bill Anderson’s autograph line and crying (my songwriting nerdy-ness knows no bounds). I dutifully carried my backpack around everywhere just in case someone needed a song. At the time, I was pretty sure that’s how that worked – spoiler alert, it wasn’t. I saw more live music than I’d ever seen, and was blown away by Lee Ann Womack and Dolly Parton singing “Jolene” on the main stage. So many, many, many more memories, but all this to say these memories make playing at CMA Fest now an even bigger deal to me. 2018 was by far my most amazing CMA Fest yet. It started off on a big high note at Terri Clark’s Fan Club party on Wednesday at the Opry house. Terri was kind enough to have me as a guest along with Anita Cochran, Dallas Smith, and Ashley McBryde. It was such an honor to be included and I met so many great folks, and I’ve decided I must start covering “Poor, Poor Pitiful Me” – if only so I can sing about waiting on the Double E.
Thursday began with my 2nd Annual Cold Beer & Country Music Hang at the Tin Roof. It was so much fun, not only to play, but to have time to meet and talk with folks. I loved being able to show off some of my super-talented, friends too: Jess Adams, Kimberly Kelly, Chris Canterbury, Faren Rachels, Rob Snyder, Stephanie Lambring, Tara Thompson, and Alex Kline all played as well. Then it was over to the Bluebird for an early round with Tara Thompson, Phil Barton, and Danielle Peck. The Bluebird is always such a cool place to play; there’s camaraderie that comes with playing in a round, and you can hear a pin drop when folks are singing. Friday I headed over the Acoustic Corner Stage for the SESAC take over. Wow, now that was an awesome show. It was so cool to look out in the crowd and see Whiskeytown Crier shirts and hats, and folks singing along with my songs. One of my favorite moments was getting to sing “Long Black Veil” by Johnny Cash. I capped off the week by opening for Katie Armiger at The Root Cellar. The sound was killer and the beer was cold. Got see a few new friends before everyone dispersed till next year. A big thanks to everyone who made these shows possible and to everyone who came out – these are memories I will cherish!